On a good day, P.S. 160 in Jamaica, Queens, is about 30 minutes from the American Museum of Natural History–that’s if there’s no traffic, no construction and none of the bizarre incidents that so often hinder movement above ground in the greater NYC area. In other words, on every day except Sunday, P.S. 160 is more than an hour from the AMNH. This little geographical fact, in tandem with the almost Byzantine complexity of school bus schedules, means that it is logistically impossible for our students to visit one of the world’s premier natural history collections via public transportation–even when the school is able to score the tickets. 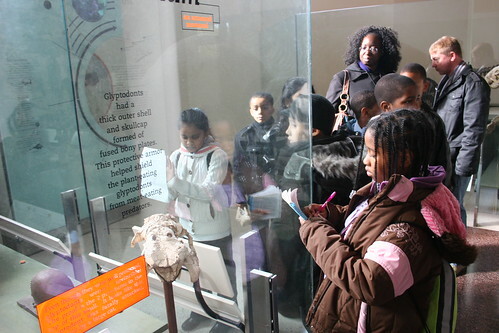 This also means that the vast majority of the students at 160 have never visited the AMNH at all. 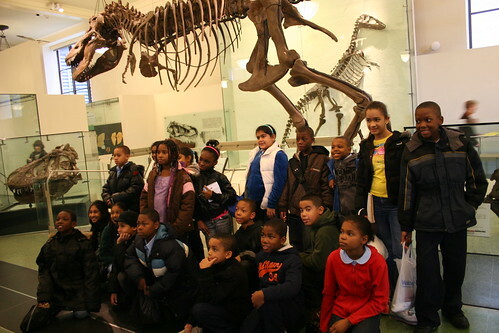 Fortunately, we were able to get in touch with our good friends over at Varsity Bus, who stepped in last month (yes, we are just recovering from the holidays) and generously shuttled all the fourth-grade students off to everyone’s favorite Manhattan museum. The primary goal of the visit was to get students up close and personal with the Native American – Eastern Woodlands Exhibit, in conjunction with that particular section of the required NYS curriculum. As you might expect, though, it was the dinosaurs that caught everyone’s attention. If you’re impressed to see 10-year-olds dutifully taking notes on the exhibits, you’ll be even more surprised to hear this: it wasn’t required. “They were taking notes just because they were so excited, and they didn’t want to forget their experience,” says Mrs. Figueroa. And, if we needed any additional evidence that access to cultural institutions is absolutely essential for young minds, Mrs. Figueroa’s last piece of intelligence totally clinches it: “Two of my students were so excited about their visit that they went back the following Saturday with their families.” Score and score.